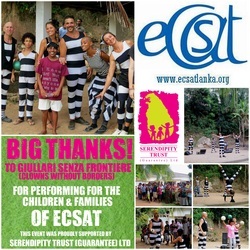 The Serendipity Trust (Guarantee) Ltd recently sponsored a special performance by Giullari Senza Frontiere (Jesters Without Borders) from Italy for the children and families of ECSAT (Equality-based Community Support and Training). Big thanks to Giullari Senza Frontiere who spent over 2 months travelling around Sri Lanka bringing smiles and laughs to communities, schools and community organisations. The children and families of ECSAT were delighted to enjoy such a special show!